When it comes to decorating a kids’ room, one of the toughest features to choose is a lighting fixture. After all, most of them are designed for other types of living spaces, and until recent years, it was all but impossible to find lighting fixtures that are designed specifically for kids’ rooms. Now, there are all kinds of cool options, including ceiling fans that are just for kids. These have some really cool designs, and not only will they look great in your kids’ rooms, they will also help to keep the air circulated, as well as providing light. Choosing the right ceiling fan for your kids’ rooms can be difficult, because there are so many styles to choose from these days. With this in mind, we have decided to review some of the most popular ceiling fans for kids’ rooms, so you can get a better idea of just what is out there. Let’s take a look at our top five list of the best kids’ ceiling fans. 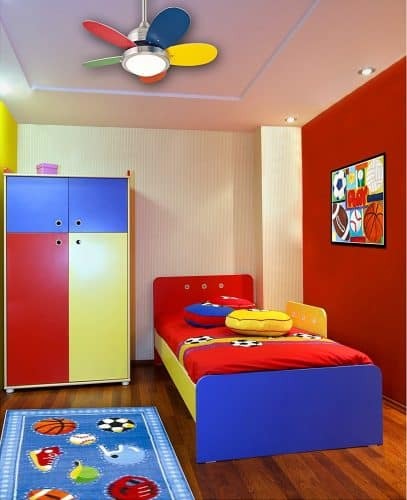 The Roundabout ceiling fan is ideal for boys’ and girls’ rooms. It has a brushed nickel finish, and it comes with a light kit that features opal frosted glass.It provides plenty of light for reading and homework, and it can circulate air for up to 80 square feet. The silicon steel motor has dual capacitor with three fan speeds, and a reverse switch so the fan can be used year-round. Size – This may be a small fan, but it is perfect to use in a kids’ room, which in most cases tends to be smaller than other bedrooms. It has five reversible blades with a 30-inch span, and it provides plenty of air circulation. 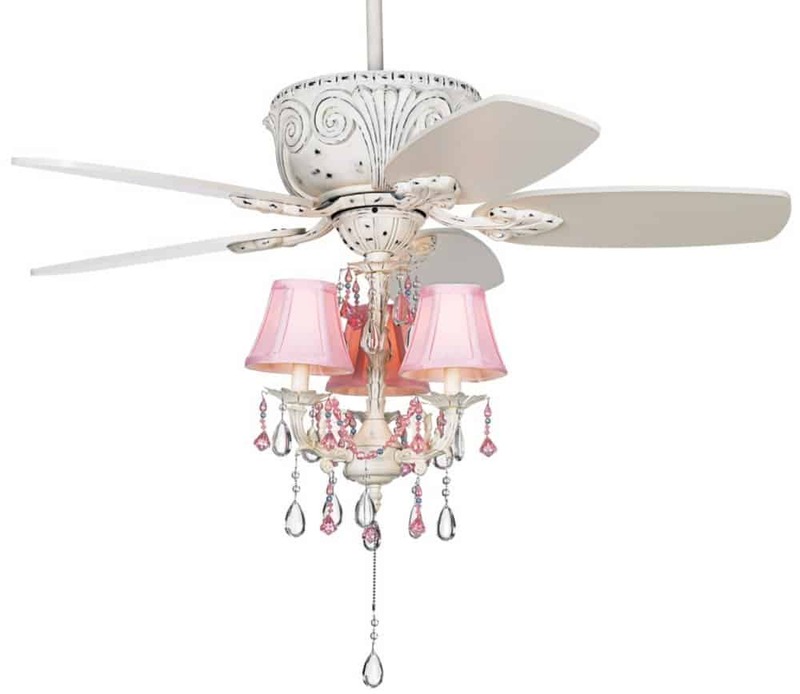 Appearance – This is an attractively designed ceiling fan with two lights. The blades are reversible, with one side having a neutral white finish, and the other being a mix of fun, bright colors. The motor has a brushed nickel appearance. Bright Light – This ceiling fan gives off plenty of light. It has an integrated light fixture that blends perfectly with the overall design, and provides more than enough light for any purpose, including reading, homework, and arts and crafts. Energy Efficiency – This ceiling fan from Westinghouse features an energy efficient motor, and the motor is backed by a lifetime guarantee. There is also a two-year warranty on all other parts, so you know you are getting a quality product that you can trust. The name “Westinghouse” says it all. Summer and Winter Modes – This ceiling fan from Westinghouse is for both summer and winter use. In the summer, run the fan counterclockwise to create a cool breeze and lower air conditioning costs. In the winter, run the fan clockwise to distribute warm air that rises to the ceiling. Great for Low Ceilings – Because this is a smaller ceiling fan, not only is it ideal for smaller rooms, it is also perfect for rooms with low ceilings. You have the option to install it with a flush mount, or with a down-rod mount for higher ceilings. Wobbling – Some users say that the blades wobble when the fan is in use, no matter which speed they are using but we would advise them to check that the fan has been assembled correctly, otherwise to return the fan for a replacement. The Hunter Fan Company 59031 Fantasy Flyer is perfect for any little boy’s room, and many little girls will love it too. If your kids are into aviation and planes, they will absolutely adore this ceiling fan, which looks like an old-fashioned airplane. I mean, who wouldn’t love ceiling fans that look like airplane propellers?! It is bright and colorful, and it will provide plenty of light for reading, studying, and a whole lot more. This is definitely a great boys ceiling fan. Reversible Motor – Not only is the motor quiet, it is also reversible. You can set it counterclockwise in the summer for cool air, or set it to clockwise in the winter to help keep the room nice and toasty. Great for Low Ceilings – This is a small ceiling fan with a low profile housing, making it ideal for rooms with low ceilings. It is designed to sit flush with the ceiling, and comes with a flush mount that is easy to install. 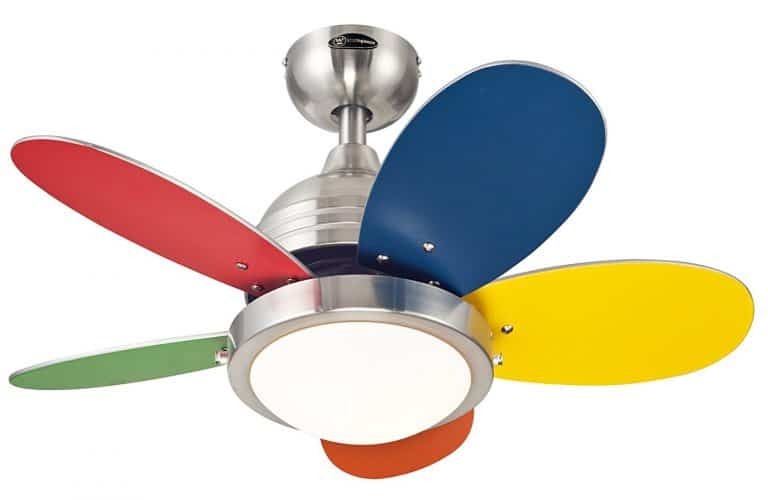 Appearance – This is the perfect ceiling fan to have in a kids’ room, and not just because of the bright blade colors. This is like having a miniature airplane right in their room, and it is as much fun to look at as it is to use. Think about the imaginative tales they can come up with that incorporate this lighting fixture. Warranty – This ceiling fan comes with a limited lifetime warranty that is backed by Hunter, the only company that has been in the lighting and fan business for more than 126 years. You know this is a brand you can trust, and that you are getting a quality product. Energy Efficiency – This ceiling fan light has a number of energy-saving features that are going to help keep your home heating and cooling costs down. These features include a motor made from high-quality silicon steel that has a better electromagnetic effect, and reversible blades. Quiet – Even if your kids need to run this ceiling fan throughout the night, it is quiet enough that it isn’t going to prevent them from falling asleep, and it isn’t going to wake them up. They will just enjoy a gentle breeze. Mounting Tape – Some users report that the included mounting tape isn’t strong enough, and that it doesn’t hold the wings in place – we say to always follow the instructions and make sure your ceiling coating will still to the adhesive – if not, find some tape that will stick to your ceiling! 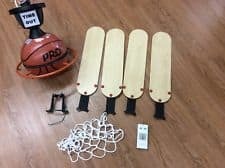 The Craftmade PS52BB is the perfect basketball ceiling fan. 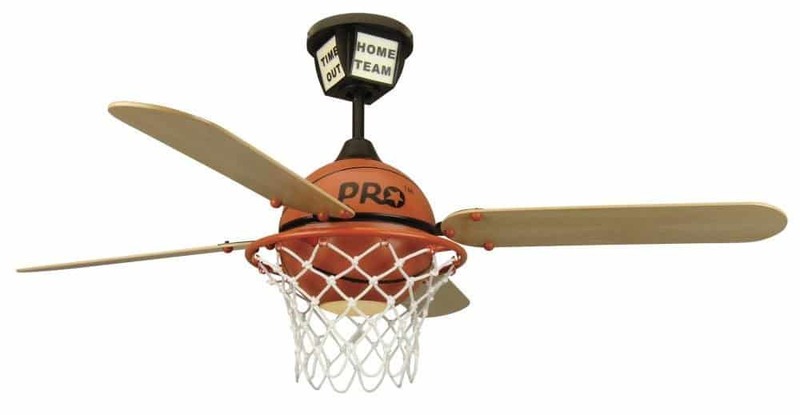 This ceiling fan has four blades with a 52-inch span, and looks just like a basketball net. 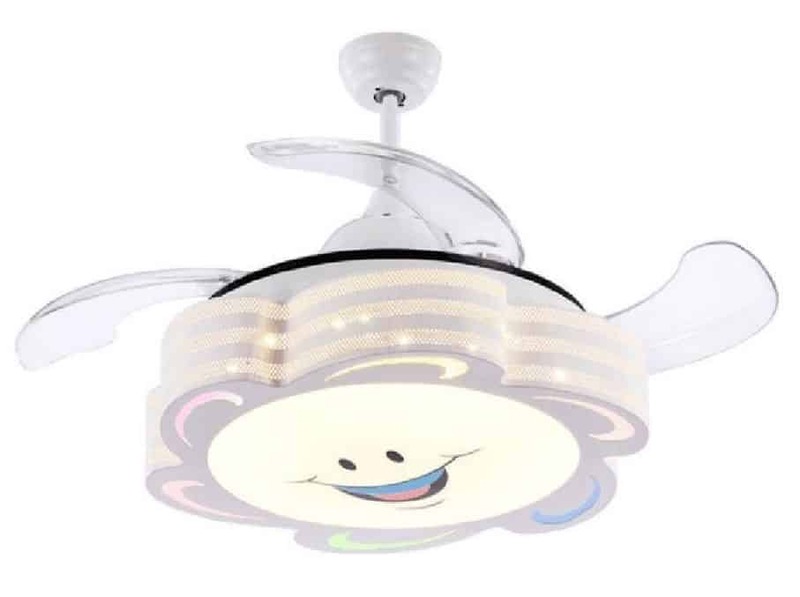 It has a light so it can be used for reading and homework, and it also comes with a handy remote, so they don’t even have to reach up to pull a cord, making this ceiling fan ideal for smaller children who can’t reach a traditional ceiling fan chain. Night Light – In addition to the regular light, this ceiling fan also comes equipped with a night light. This light is an LED canopy light that can be turned on instead of the bigger light, providing just enough light for children who are afraid of the dark. Materials – This ceiling van is made with a silicon steel housing that is shaped just like a basketball net. It even has realistic leather grain texture on the basketball, giving it the appearance of a real ball in a net. The plywood blades have a maple finish, and the glass light kit is matte opal glass. Controls – The controls are easy to use. This fan comes with a TCS handheld remote that offers three different fan speeds, as well as the on and off buttons for the light. The remote can also control the reverse button so you can choose the airflow direction. Dimensions – This ceiling fan measures 19.5 inches from the bottom of the light to the ceiling, and 24 inches from the bottom of the net to the ceiling. It has a six-inch down-rod, so it measures 14.25 inches from the blades to the ceiling, and the blades have a 52-inch span, with a 12-degree pitch. Flat or Angled Ceilings – This ceiling fan can be easily installed on both flat and angled ceilings, as long as the angle is not greater than 30 degrees. It weighs 18.81 pounds, and has a standard AC reversible motor. Dimming – There is a dimming function, so if you just want to use the light as soft nightlight, the option is there. The dimming function is easy to operate when using the handheld remote control. Not Functioning – Some users report that after installing this ceiling fan light that neither the light nor the fan would function properly. If this happened to you – simply return the fan for a replacement unit – simple! 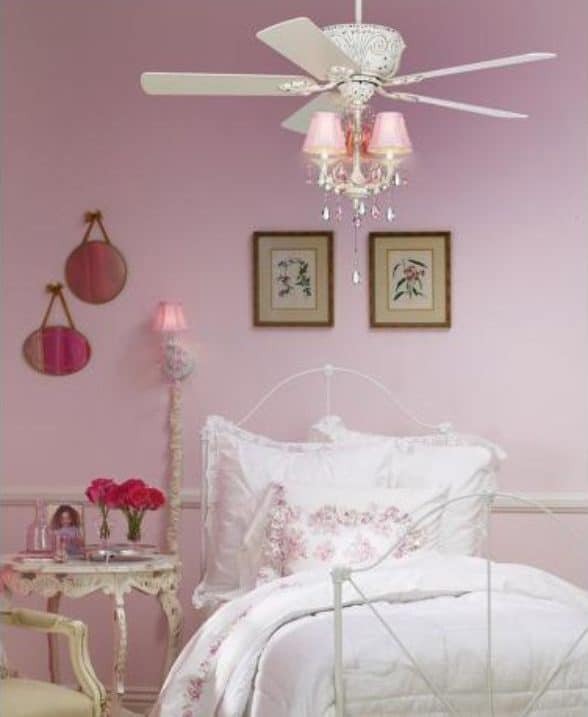 The Casa Deville Pretty in Pink is a girls ceiling fan which is the perfect addition to any little girl’s room. It is pink and pretty, and it will make your little girl feel like a special princess. It has a rubbed white finish on the motor, and the blades also have this same finish. This fan comes in either 44-inch or 52-inch blade span, with a 14-degree pitch. Quiet Motor – This ceiling fan features an ultra-quiet motor that is not going to disturb your kids while they sleep. It has three speeds, low, medium, and high, and there isn’t even much noise when it is on the highest speed. Pull Chain – This fan is easy for little ones to operate. It features a pull chain that they can use to turn the light on and off, change the fan speeds, or change the direction of the fan. You might want to extend the chain for kids who can’t quite reach it yet. Low Profile – If the ceiling is low, you don’t have to worry about not being able to install this ceiling fan. Because it is designed for children’s rooms that tend to be smaller, it is easily low-profile adaptable. Dual Mounts – You have two mounting options with this ceiling fan. For low ceilings, it can be flush mounted. If the bedroom has higher ceilings, you can install it with the down-rod mount, and the down-rod is included. Easy to Use – This is an ideal fan for kids’ rooms because it is so easy to use. There is no remote control, so even younger children can easily turn the fan or light on and off by themselves without needing an adult to help. Appearance – If you have a little girl who loves being girly, this is a perfect fan to have in her bedroom. The motor and blades are white, and the shades are a pretty shade of pink that is perfect for your little princess. None – We have found no bad reviews about this ceiling fan. We assume this means that most customers are happy with this product and have no issues with it. 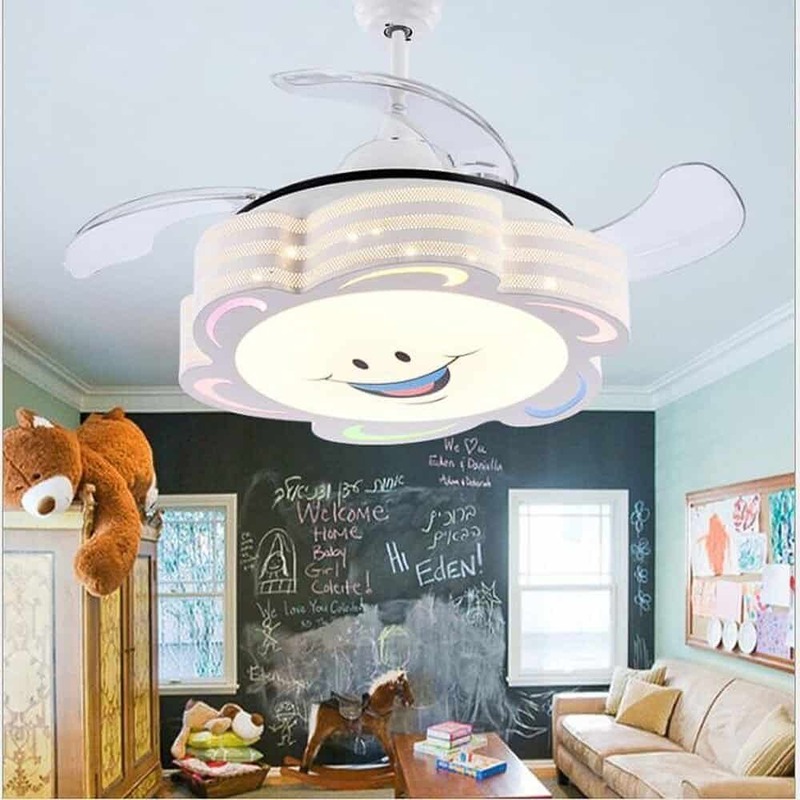 The COLORLED ceiling fan for kids’ rooms features a cute little smiley face on the chandelier section. This is a modern looking ceiling fan with a simple style that can grow with your kids. It is also great for the living room, as long as you take off the happy face feature. This fan has a 42-inch blade span, with four blades to deliver great air circulation throughout the room. Light Kit – The light kit with this ceiling fan is a boom style, in a standard length of 4.7 inches by 9.8inches. Other sizes are available. Simply contact customer service if you need something that is larger or smaller. Three Speeds – This ceiling fan light comes with a handheld remote control that lets you control the three speeds, mute the motor, and reverse the air flow so it can be used in the summer and in the winter. Quality Materials – This lighting fixture is made with high-quality materials. The blades are guaranteed not to rust or deform over time, and the shade is made of acrylic and is very easy to clean. This is the ideal ceiling fans for kids’ rooms, and it will not burn itself out in just a few months and need to be replaced. Easy Installation – This ceiling fan light is easy to install, and it can be mounted flush to the ceiling. But, even though it is not difficult to install, for safety reasons, it is recommended that you have it installed by a licensed electrician, as you should with any wired lighting fixture. Controls – The fan and lights can be controlled individually with the handheld remote control. They can also function together, simply by pressing a few buttons on the remote. The controls are even easy enough for small children to understand and use. Warranty – This ceiling fan light comes with a one-year warranty. If it is defective, you can send it in for repairs or replacement. This warranty does not cover regular wear and tear, only defects on workmanship and materials. None – So far, we are unable to find any customer reviews about this product, positive or negative, so we assume customers are happy with this ceiling fan. If you want to have a fan in your kids’ rooms, but you don’t like the dangerous aspects of using table and floor fans, a ceiling fan is a great option. Not only is it going to help circulate the air in kids’ rooms, it is also going to provide the light they need for studying, reading, playing games, and more. Any of the ceiling fans that we have discussed today will be great for kids’ rooms, and some are specific for boys or girls (but can be used by both, depending on what they really like the most).